Al Fahim is currently in Spain where he is indulging one of his great loves, chess. He was a very useful chess player in his youth and supports the UAE chess federation and has secured an invitation to the Karpov-Kasparov battle in Valencia. He gave several interviews to the Spanish media where he discussed chess and his role at Portsmouth FC. The Guardian picked up one of the interviews where Al Fahim indicates that there is likely to be no major investment until the summer as the 'necessary liquidity' will only be available at this time. Portsmouth supporters, who are already concerned by the performance on the pitch, are not expected to be pleased at this news. Al Fahim is due to meet a group of fans ahead of the game against in-form Everton on Saturday. "We're not in a hurry to sign stars and we're not going to go into the transfer market at the moment. We'll probably start signing next summer when we have the necessary liquidity to do so. It depends on how the business side of things evolves between now and then but that would be the logical stage [to do so]. "My model of a club is Arsenal. The philosophy they have of signing young players so that they can grow within the club is ideal. Barcelona are the perfect example too – they signed Lionel Messi at 13 and developed him from the start. "We have come into Portsmouth because we see an enormous amount of potential here – if we chose this club ahead of others it was precisely because of that potential," he said. "But we have to start by giving the club the right infrastructure. We have to do things at the right time and right now the priority for Portsmouth is to create the foundations so that it can be a stable and serious club in the future." Al Fahim is currently in the USA attempting to raise additional funding. He has given a series of interviews to unquestioning and somewhat under-researched reporters. We have posted the article from Saturday's Washington Times. He advises that manager Paul Hart has been been given the player budget that he has asked for. He discusses building a 40,000 seating stadium for Portsmouth. Given what has gone on at the club it is simply inconceivable that that Hart asked Al Fahim for his current acquisition budget (largely free-transfer players). Hart has gone on record to say that the budget he is having to work to is even tighter than he was led to believe. The Portsmouth Ladies team are not part of the Portsmouth club that Al Fahim has purchased. Although Pompey fans have had a tough summer and gates have understandably fallen, there may not be sufficient demand for a 40,000 stadium as things stand (with current gates of around 18,000). A new stadium is likely to cost upwards of £60m and would probably generate an extra £13-17m a year if it could be filled most weeks. This extra income would need to be offset against the cost of servicing a loan of £60m - around £8m a year. Sulaiman Al Fahim, an American University graduate, is the latest overseas businessman to buy into the English Premier League. A native of the United Arab Emirates, Al Fahim became the sole owner of Portsmouth FC late last month in a deal worth $100 million. Nicknamed Pompey, Portsmouth FC was promoted to the prestigious Premier League in 2003 and came in 14th last season in the 20-team table. Often referred to as the "Donald Trump of Abu Dhabi" for his real estate projects and "Apprentice"-style reality show, Al Fahim is eager to pump new life into his team. "Portsmouth is a club that has potential to grow," the soft-spoken Al Fahim said Wednesday. "The club has a great history, established in 1898, and during the 1940s and 1950s was one of the biggest teams. Last year the club won the FA Cup. For me it just sounded really attractive to invest in the game." The Premier League is a big attraction in the Middle East. Al Fahim said the television rights in the region for Premier League games cost $6 million in 1994; now, the rights sell for $350 million. A quarter of all the money in Europe generated through soccer comes from the Premier League, he said. Al Fahim got involved in top-flight soccer a year ago. He was the key negotiator for the Abu Dhabi United Group, which purchased Manchester City in 2008 for $363 million. He left the group to buy his own team. "With Manchester City I was part of a group, but Portsmouth is my personal work," Al Fahim said. "I have a long-term vision. The fans want me to spend money, but we can't match what Manchester City and Chelsea spend." Portsmouth saw a number of its top players, including Peter Crouch and Glen Johnson, leave the club this summer. The team hosts Bolton on Saturday and is looking for its first win after opening the season under new coach Paul Hart with four loses. "I told Paul Hart that from now on he should look for players and give me the budget," Al Fahim said. "I told him I don't want to see my club going down. I don't want my club to go below 14th." To increase revenue, Al Fahim plans to build a 40,000-seat "eco-friendly green stadium" by 2018. The club's current venue holds 20,000. "Portsmouth is the only Premier League team south of London and has a potential fan base of 8 million to draw from," Al Fahim said. The Dubai-based businessman said he has no plans to invest in Major League Soccer but he does have contacts in United States monitoring American players. Now in his early 30s, Al Fahim came to live and study at AU when he was 21 after the death of his parents and younger brother in a traffic accident in Dubai; he went on to earn a master's degree in business administration. He was back in the District to talk to congressional leaders about green housing. Through the years, Al Fahim has promoted numerous sporting events in the United Arab Emirates, sometimes challenging prevailing traditions. He has funded horse-riding programs for women and said he wants to see more women play soccer in the Middle East. He even suggested taking the Portsmouth FC Ladies team on a tour of the region. "We need to break concepts and perceptions," he said. "Sports is the best way to do that and bring people together." Al Fahim also has invested resources to fight malnutrition and has funded a clinic in Kenya; he plans to open another in Haiti. The truth about Al Fahim's protracted takeover has finally been divulged by a an increasingly frustrated Peter Storrie. Other interested parties (Al Faraj) are still keen to invest in the club, however Al Fahim is loathe to dilute his position of full owner. Gaydamak is still on the board to protect the debt the club owes him. Colin Farmery began by outlining the purpose of the meeting and the PVA, that being setting up a dialogue between the club and the websites, to communicate and listen to each other. The PVA currently covers the interests of thirteen Portsmouth FC fan websites, who are concerned at the current situation of the club. It was stated the it had to be understood that there were a variety of items which the club would be unable to answer because of confidentiality. Each attendee of the meeting then introduced themselves and, where appropriate, which website they represented. that the resulting discussion also eventually incorporated items 2 and 3, so theseare dealt with in one section in the minutes. - Has been at the club for around seven years and, in that time, no owner has put equity into the business. Every owner has only increased club debt. - Average turnover is £60 million, this year will be the first in which the club is close to break even (£30-£40 million on wages, £20 million on other costs). This leaves no money for player transfers when previously club has lost heavily each season. - Has personally wanted to save the club over the last year, but acknowledged the tremendous help received from other Pompey staff. - Stated that banks could have called in money at any time, and still could. Indeed Standard Bank called in the loans this was bringing the club down club down, hence players had to be sold. Question from Mike Hall - Has Sulaiman Al Fahim completed his takeover and, if so, where is his money? - In February, Peter was approached as Al Fahim was interested in buying the club. League Final in Rome. Memorandum of Understanding (MoU) was signed. - Al Fahim has club at heart but has, so far, only talked. Finance director not getting answers on how to fund the club, and Al Fahim doesn't yet understand how the club runs and how it relates to things like the Inland Revenue, but he is working hard to raise funds. Additional from Mike Hall - Are the Al Farraj brothers still interested? Question from Scott McLachlan - Will he start releasing statements through the club? impediment in the deal Al Fahim has done with Gaydamak, to prevent him selling the club on. bonus, and will this go into the club? Question from PVA (sorry, didn't catch who this was) - Can the club shed any light on the supposed 48-page dossier? Question from Vern Rickman - Is Al Fahim listening to people regarding their views on his statements and his publicity stunts? - Al Fahim is doing his own thing, he doesn't appreciate how it comes over to fans, and doesn't really appreciate how things work but wants to attend next fans forum. Question from Scott McLachlan - What can the club do to get confidence back in the club after a summer of broken promises, there is no enthusiasm for some people to come to Fratton Park? - Haven't got the finance to start the training ground as it stands, or to start work on turning the ground. We have a fantastic new design for the ground and this can be moved quickly with finance. Would like a 4,000 to 5,000 family enclosure. Also said that what doesn't help is other clubs returning late tickets as Portsmouth have to sell these tickets at the same price the returning club was charging. - As a thank you to STH’s he said the club are announcing two increases in discount to Season Ticket Holders. As a thank you to STH’s we are delighted to announce 2 increases in discount to STH. purchase(shirt, shorts, socks). This means STH’s can get a S/S home adult shirt for as little as £28.00. This offer is open until 30th November 2009 and should prove useful with the home kit just being launched & the new 3rd kit being released on Oct 7th. 2) Additionally, STH normal discount of 5% has been increased to 10% from today and will run until May 31st 2010. This means any full priced item can now be bought for 10% off in the PFC shops. This offer does not apply on line as these shirts are currently at a higher price and STH would not benefit from the full discounts. For STH to receive their discount they must provide their own valid season ticket at the tills when purchasing. Question from Peter Corrigan - It's great to have players who want to be here instead of the "overpaid, sulky" players we did have, but will Peter Storrie be staying? - Yes, he has just bought a new house and turned down a huge offer from a big club. Comment from Jim Bonner - Has seen and talked to other fans who would love to be in our position, in the top leagues having just won the FA Cup. - Partly the club's fault for allowing expectations to get too high. what do the club think of the Mirror article of the 12th which basically stated the fans were in revolt over unanswered questions? - Yes, working with Portsmouth University and also sponsoring their athletic teams. The club has very good relations with the fans. Comment from Vern Rickman - Feels that Peter has had a good summer, and it has shown how much he cares about the club, with what he has done and said. The chairman then moved the discussion onto Point 4, role of fan websites. What can the websites do for the club and how can we move forward? Johnny Moore and Chris Hayler on how the club and websites can work together. The journalist Matt Scott at the Guardian has been one of the better UK journalists over the 'Al Fahim affair'. His recent article on the takeover paperwork is particularly interesting. Al Fahim signed the official paperwork, registered with the FAPL as 'Dr' Al Fahim. Quite why he persists with this bogus title on legal documents is bewildering. He also gave his occupation as 'Goodwill Ambassador'. Regular readers will recall that this relates to the rather suspect IIMSAM organisation which is already being investigated by the UN for maintaining that they are part of the UN. There have been a number of questions about the funding and deliverables of IIMSAM and it would be truly worrying if they were able to support Al Fahim in a way that made it his 'full-time' occupation. At the first home game of the season against Manchester City, Al Fahim was at last able to celebrate his ownership of the club. Al Fahim wore a replica Portsmouth Away shirt and a baseball hat. He even had his name and year of birth (77) printed on the back. During half-time and at the start of the second half, he paraded round the ground milking the applause. He embraced a number of the disabled fans and then sat with the fans for the start of the second half. Some fans were not impressed and the UK journalists were quick to pour scorn Al Fahim. These kind of gestures and this 'self-centred' approach rarely impress the hard-core fans in the UK. The message from Al Fahim was that he is 'one of them' and shares their ecstasy and pain. Regular readers will have noticed a distinct lack of updates recently. Sorry about this absence but we have been away from access to the internet and technology for the best part of two weeks (yes such a place does exist). We would very much have liked to have kept you updated with the astonishing events of the past week. However judging by my emails it looks like this saga has still got plenty of life in it. We will provide an update on the financials of the takeover the early part of next week. However we are advised that Al Fahim is seeking to conduct a 'leveraged' takeover of the club. This means that a significant portion the club's future income will be mortgaged in order to provide the funds required to purchase the club. Al Fahim is now the sole owner of Portsmouth and is keenly looking forward to the game against Manchester City. He has stated that, for him, this is the game he wants to win more than any other. The game sees the two UAE owned Premiership teams compete in a tie that will be the focus of the UAE sporting world. It will give Al Fahim the opportunity to host his compatriots and former employers and help re-establish his status which was hit by recent events at Hydra and Portsmouth. For Al Fahim, it is very important that this game and and the hospitality arrangements all go well. Portsmouth FC have announced that an alternative consortium is now in the bidding for the club. Although the official statement has left the door open for Al Fahim to join with CEO Peter Storrie, this arrangement seems increasingly unlikely. Relationships between Al Fahim and Storrie have been strained lately with Al Fahim's procrastinations a particular cause of irritation. The club needs an injection of funds for player purchases and to takeover existing funds. Al Fahim has struggled to raise the required capital and would bring little of immediate value to the deal. Al Fahim's role in the Portsmouth saga looks like it is coming to an end. With the Transfer window set to close on 31 August, it is unlikely that any consortium will be able to deliver new player purchases in time. Back on 4th August Portsmouth FC announced that additional funds were required to finance the club and that, should the takeover not take place, additional player sales would be required. With only 10 days to go until the end of the transfer window, the club now needs to take some hard decisions. The club need revenue to finance ongoing running costs until the next tranche of Sky payments in the new year. Al Fahim's plans were to include the provision of new funds as part of the takeover. However securing new funds has proved so difficult that the new funds injection now looks far from certain. The transfer window closes on 31 August and as we recently reported, the club will need to make a decision in the next 48 hours on whether they believe the takeover will go ahead. If the club is not absolutely certain that the takeover is going to provide the new funds before 31 August, then player sales must be made to preserve the club financial position. With the Premier League requiring a week to process the 'source of funds' submission, the club are aware that they need to make a decision now. Recent reports in the Telegraph make interesting reading and support this site's long-term contention that Al Fahim does not have the required funds to complete the takeover. The prospect of Al Fahim borrowing against future TV revenue streams is clearly a desperate move for Al Fahim. The Sky TV money for a Championship club is around £2m per season (as oppose to the circa £40m that is earned in the Premiership. Any prospective lender would take this uncertainty of income into account. With Portsmouth one of the favourites to finish in the bottom six, it is unclear whether banks will indeed see the arrangement as sound investment. 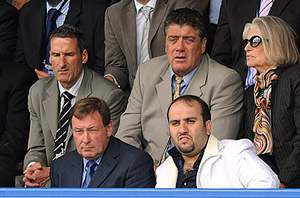 Choosing to wear and eye-catching white jacket, Al Fahim was the focus of all attention in the Directors' box, sat next to Peter Storrie. Despite the pre-season disruption, Portsmouth had the majority of the play. However it must have been evident to Al Fahim that additional investment is required to ensure the team create more chances and improve their cutting edge up-front. Al Fahim has given an 'interview' to one of the tame Arab business newspapers in an effort to improve his increasingly tarnished image. Unlike the UK medial, newspapers in the Arab world are rarely critical and with the right contacts you are able to maintain editorial control over articles. Yesterday's piece in the Business 24-7 illustrates this point. This issue is well illustrated by the paragraph regarding IIMSAM - no independent journalist would submit copy containing this turgid text. Al Fahim however is keen for the role of IIMSAM to be talked-up and for spurious connection to the UN to be maintained. In the 'interview' Al Fahim is keen to start the 'rumour' that he is about to receive a £100m bonus from Hydra. We are aware of no such rumour circulating prior to this astonishing claim in this article. Given that Al Fahim will have his image tarnished should Portsmouth, as expected, pull the plug on Al Fahim, he needs to ensure that he is still seen as a man financial might. However this £100m claim is clearly bogus. This week, Hydra finally announced that it is scrapping all its developments, other than Hydra Village (plus two smaller tower developments). The company also made it clear that it needs additional cash to continue the projects and that this have to come from owners Royal Group. The entire Hydra venture is set to be loss-making for Royal Group and the prospect of a huge bonus to Al Fahim is inconceivable. Al Fahim was sacked as CEO and 'moved upstairs' to the Board in June. The size of the '£100m bonus' is also fanciful. Of the 2,500 properties at Hydra Village, just 60 are considered as 60% complete - most of the rest are not even started. The sales receipts from all 2,500 properties is less than £200m. The notion that the astute Royal Group would pay a bonus of £100m bonus on a partially completed, loss-making project is simply beyond belief.